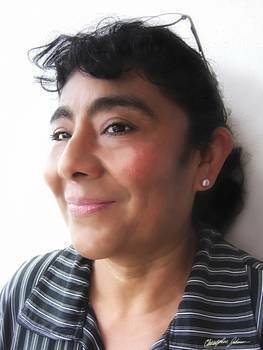 This portrait is of Gloria, Gerardo and Jonathan's mom. It is from a photo I took a few months ago. I needed a break after doing the first few portraits. Although she's probably in her mid-fifties I think she looks more like 35-40 from my post processing. I only went through my usual remove sun damage, minimize wrinkles, and touch-up skin routine that I always do. I didn't apply special effects. It helps that she was already beautiful to start. I only had to remove the horrible signs of aging and fix the lighting. Gerardo was happy and surprised when he saw it last night and he gave it his approval. I hope you like her portrait too. If you would like a photo-portrait for you, a family member, or a friend, please let me know. If you want it non-exclusive and will buy your print from Imagekind or Redbubble and don't have any special requests the cost is my normal artwork markup. If you want exclusive prints of the finished work (I don't make it available for prints to others), or if you want a high-resolution jpg for making your own prints there will be an additional charge. I can take your photos here in Mexico City or you can send several high-resolution photos by e-mail. It would make a great Christmas or birthday gift! La mamá de Gerardo y Jonathan, Gloria es una señora bonita y bueno con solo editar lo que pasa con todos con los añitos y el maltrato del sol, le quite mas o menos 15 años de edad. La foto original tomé hace unos 2-3 meses en una fiesta. No tuvo tiempo para arreglarse y bueno no fue necesario. De hecho prefiero editar las fotos de gente con una imagen mas natural. Si te interesa un retrato para ti, tu pareja, un familiar o un mejor amigo, pongamos de acuerdo para tomar las fotos aquí en Cuautitlán (en el norte de la Ciudad de México) o me puedes enviar por correo electrónico unas fotos de alta resolución. El costo depende de como quieres el trabajo y si quieres que sea exclusivo o no. Gerardo's mom, The photo was touched up to remove sun damage and minimize wrinkles. I was watching some of the videos in the Learn and Master painting course where Gayle was showing how to make different brush strokes and I was trying them and then I felt inspired to improvise and I wanted to paint a cone and well a cone by its self is a little too abstract so I turned it into an ice-cream cone. I used a pale yellow, brown, white, and blue. I mixed all of the non-white colors with white to get light shades. 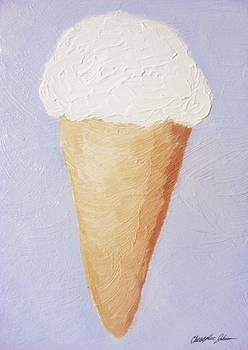 The ice-cream part of the painting is white with a touch of yellow. It is a little too creamy because I forgot that some of the top of the cone would get blended up. It takes almost no color paint with white to make a light color. I'd say a "drop", but oil paint is very thick. The cone and the background were painted with the paint thinned with solvent since I don't have medium. I have a list of things I need to buy, but I have already gone past my original budget for the year so I hope I'll get some art sales soon! I kept the paint on the ice-cream thicker. Not out-of-the-tube thick, but more like mayonnaise thick and I just kept adding it until it looked rich and delicious. The surface there is about 1mm higher than the rest of the painting. I wonder if that would qualify as impasto? 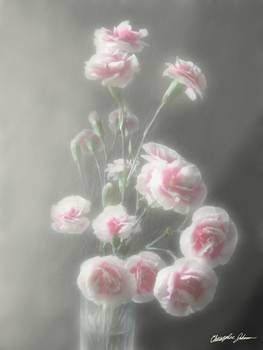 Carnations are my favorite cut flower since they are not common in gardens yet very cheap cut. They also keep nice for about 3 days. They also come in quite a few different color combinations. Roses are also easy to buy as cut flowers, but cut-roses seem to be inferior in quality compared to those I can find growing in parks or sidewalks. 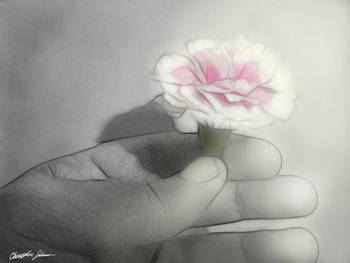 Here are the first two in my pink centered carnation flower series. The centers are pink and the rest is white. This was my second attempt at painting with acrylic paints and my first 6x8 (inches) with acrylic paint. It was done in layers over three days. I guess I spent about 3-4 hours on it. I imagine someone with experience could have done it much faster. On the second day I was very unhappy with it and almost painted it over with white to start from zero. I am happy to say that I resisted and I really like the results. I hope you like it too. It is supposed to look like a pine tree with the light from behind and a subdued sky which fades to white. Since it is supposed to be a Christmas like cold climate winter scene, the ground is white to represent a heavy cover of snow. Would you like to learn to paint? About a week ago, I first tried acrylic painting with a small bookmark. As I expected, I really didn't like how the paint was dry in only about 3 minutes so I had no time to mix and blend. A day or two later, I spent a while (at least a half an hour) starting my first oil painting on a 6x8 inch pressboard wood rectangle that I had already painted a couple layers of white acrylic. 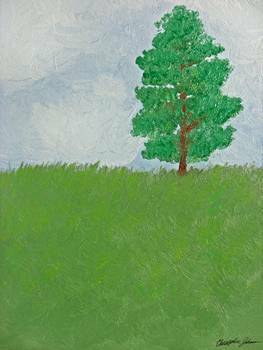 It is a simple tree on a green hill with a cloudy light blue sky. I only used blue, green, and white as colors at first. I mixed both green and blue with white to get lighter shades and painted the upper part blue and the lower green and blended the green up in stronger thinner strokes. I then mixed some more white with the blue and made parts of the upper part lighter. A few hours later, I decided to paint a tree. You'll probably see many tree paintings because I always loved to draw trees even though mine were never realistic. Oil painting has the opposite problem it takes many days for it to dry so while you have time to mix and blend on the support, working in layers could take weeks to finish a complex painting. This painting took about 5 days to dry. 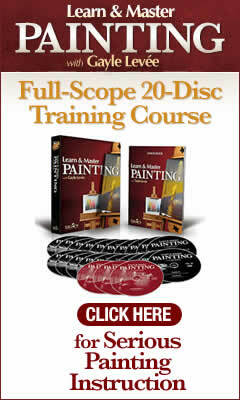 I'm very excited today because my Learn and master Painting course arrived just a few hours ago. I asked in a blog post for feedback on this course and what it offers. While I agree that a course isn't absolutely necessary and while several friends offered to answer questions (thank you Facebook friends! I'll still ask questions. ), I really didn't want to be constantly asking more than one question a day and a little voice kept asking me if I was really messing up this last week since I got some very basic supplies. I got just the course not the kit including paints and brushes. I haven't yet started viewing the course videos, but just opening the box was amazing. If the course is as good as the packaging, I'll be off to a great start in developing my oil painting skills. The box acts like a binder with a flap that folds over the top right. The flap seems to be felt lined. When the flap is lifted the top folds open to the left and there is a pocket with the lesson book. The DVDs are all in plastic sleeves. The inside back cover says what the course contains and how to get started (watch the introduction video). The lesson book for Learn & Master Painting is in full color with great photos to help explain everything. My biggest question during the last few days was how to organize the palette, mix colors on it, and how to clean brushes and store paints and solvents. The book actually covered Those topics on five pages at the beginning of the lesson book. I might have been able to find that information online, but not all together and not with all those great photos so I could see what was being explained. The packaging is both elegant and practical. I can see that a lot of care was put into the design yet it is very practical because it can be folded back up and kept on a shelf in the amount of space a photo album or art book would take. The biggest problem I've had with multi-disk/multi-CD collections was that some would always get lost. I really admire the designer who didn't cut costs and thought about the user taking the painting course. Morning glory flowers are not easy for me to edit so I was very happy with how quickly I was able to edit this morning glory photo I had taken a couple blocks away in late October. 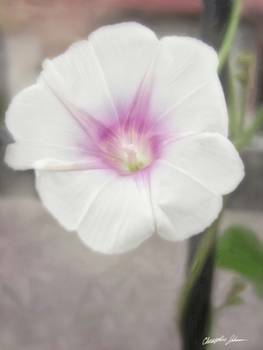 Since I had taken the morning glory photos, the city went through and cut all the wild flowers back to short-grass level. This shows you how important it is take your camera with you even to places you go regularly. You never know when it will be gone. You know that until now I've only posted photography, photo-art, and other digital abstract artwork including one drawn with a tablet, but I've decided to learn how to paint. Painting is as valid a form of art as my photography, drawing and other visual art. It uses very different skills. I'm going to include in posts my attempts at painting and I hope you'll see progress as I add new works or studies in different topics. If I do a study from a book or course, I'll mention it otherwise you can assume that I was just experimenting. Feel free to login and comment on them and give me ideas. Remember that I'm new to painting not art so I am not familiar with painting terms and techniques or steps. I bought my sample paints both oil and acrylic earlier this week and this morning I bought three sheets of a kind of press-board wood at the lumber store in Tultitlán so now I have wood to paint on in four sizes starting with 6x8. I also asked for the scraps. This work was in a scrap piece which I used for a bookmark for my neighbor who likes to read. 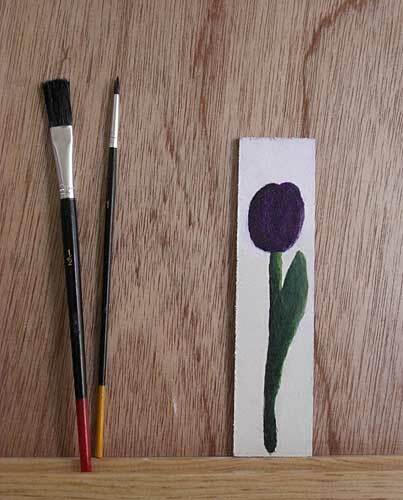 This is supposed to look like a purple tulip drawn in acrylic using purple, green, yellow, white, and black. I used the white and black to make lighter and darker shades and the yellow to make the green different shades. I found the experience to be interesting. I was frustrated with the paint drying in about 3 minutes yet there were moments I wanted to add a new layer and misguessed the time. I really need to watch the time while I work. Trying to see what else I could do with those pretty mauve-pink chrysanthemum flowers, I came up with these two. 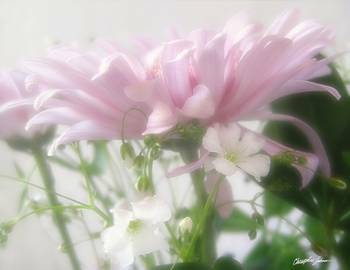 #3 was just featured at Redbubble this morning in the "in the pink" group which shows you how you never know what people will like. 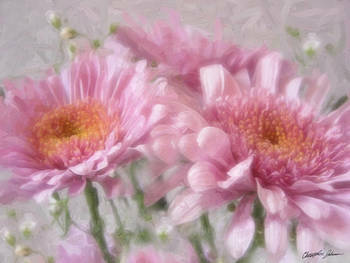 My favorite is Pink Chrysanthemums 2 from the previous post. 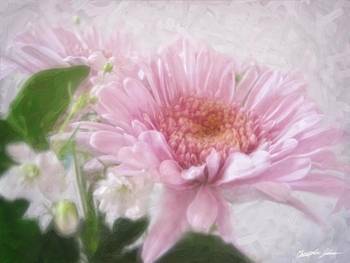 Here is the second mauve-pink chrysanthemum artwork in the series from today's flowers. This one has a painterly impressionistic look. I'm very happy with it. I normally don't include posts about specific products since I have the shop page, but I'd really appreciate the feedback from the painting experts here about this home study system for learning how to paint. Quite a few of you know from Facebook that I am very interested in learning how to paint and I've started saving up for supplies. I don't have any painting supplies at all and I am not aware of any painters living nearby who would let me observe them work. Yes, I'm sure there are painters in Mexico City, but it is a huge place. This kit comes with 20 DVDs with videos of a painter showing how she does it, color theory, setting up the work area, using reference photos, brushwork technique, etc. and it comes with brushes and oil paint of the "Winsor and Newton" brand. The DVDs divide the painting into lessons and there are tasks to carryout. I watched a video clip on the sales site on using the palette to get light/dark variations with yellow and it was cool. What do you think, is "Learn & Master Painting" worth it? The price for the complete kit was $349 with an option to buy it in several payments. Click on the link to check the current price.